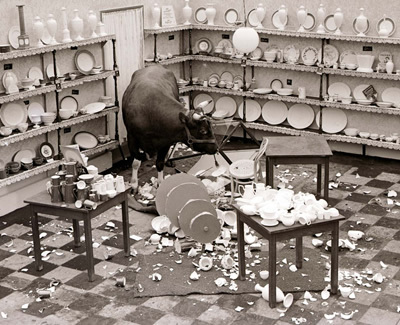 I hope you all had a wonderful Thanksgiving Day and have survived Black Friday with your sanity, if not your wallet, intact. In the spirit of giving that marks this holiday, The City Of Costa Mesa needs your help. Here's the text of a press release recently issued requesting help from the community with the presentation of the Snoopy House event early next month. If you're in a position to provide some time or some of the materials they're looking for, please step up and assist with this very worthwhile event. 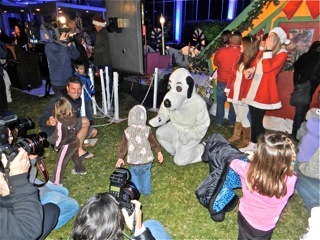 COSTA MESA, CALIF.—For the second consecutive year, Costa Mesa City Hall will be home to the 46th annual Snoopy House holiday display from Dec. 14 through Dec. 25 from 5 p.m. to 9 p.m. The iconic display was originally hosted by the Jordan family in Eastside Costa Mesa for 44 years before City Hall became its new location last year. On Nov. 30 and Dec. 1 from 8 a.m. to 3 p.m., and Dec. 2 from 12 p.m. to 4 p.m., volunteers are needed to assist with moving, setting, and assembling display pieces. From Dec. 6 through Dec. 9 from 10 a.m. to 3 p.m., volunteers are needed to assist with painting, trimming, and other maintenance of the display pieces. From Dec. 14 through Dec. 25, volunteers are being sought to work at the community booth from 5 p.m. to 9 p.m. nightly. From Dec. 26 through Dec. 29 from 10 a.m. to 3 p.m., the display will be disassembled, and volunteers are needed to assist with moving display pieces. Please note that heavy lifting will be required for those assisting with moving and setting display pieces. Time slots are flexible, and large community groups are welcomed to volunteer. To volunteer, contribute items, or obtain more information, contact Jim Jordan at (714) 556-3036 or snoopyhouse@gmail.com. 12 rolls of LED light strands in C7 or C9 lamp size. Rolls are approximately 65’. 50 sleeves of tinsel garland in mixed colors. 10 assorted wreaths in 12” to 24” sizes. 12 cans each of black and white spray paint. Epson Artisan 725 printer ink in all colors. Matte finish photo paper and photo sleeves to accommodate 2,500 to 3,000 prints. 3,000 6” red and white candy canes. Apple cider and 6 oz. cups. For a complete list of supplies needed, please visit the Snoopy House page on the City’s website. To make a monetary donation toward the purchase of supplies, please make checks payable to: City of Costa Mesa Snoopy House. Checks may be dropped off or mailed to: City Hall, Finance Department, 77 Fair Drive, Costa Mesa, CA 92626. A donation drop box will also be available at the community booth during the event. Well, we made it to another turkey day but I can't say the same for that little bird in my refrigerator. 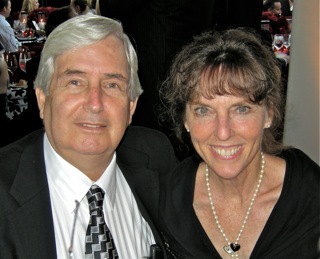 For the first time in more than 3 decades my sweet, lovely and VERY patient wife and I will be home for Thanksgiving. Yep, we're actually going to cook the smallest turkey we could find tomorrow and just relax and enjoy the holiday. We hope you all do the same. 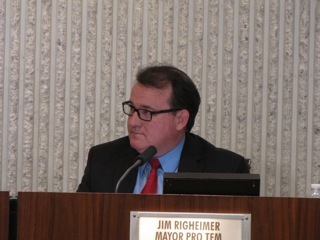 During the last city council meeting Mayor Pro Tem Jim Righeimer sounded like he was offering up an olive branch. He implied that he had seen the error of his ways over the past two years and wanted to take a mulligan and start over. Well, in the spirit of the season, I'll give him the benefit of the doubt until he demonstrates, once again, that he is not to be trusted. I just checked the Registrar of Voters site and it looks like the counting is finished. At the top of the page it says "Official Cumulative Results". None of the local numbers have changed since yesterday, so we'll just have to assume (dangerous practice) that what we saw yesterday is the final tally. If the numbers do change later tonight I'll update you. So, congratulations to Sandra Genis, Steve Mensinger and Gary Monahan for their victory. And congratulations to John Stephens and Harold Weitzberg for running a clean, professional campaign. I have many things for which I'm thankful again this year. First, of course, is the woman who has been at my side for 45 years. Without her love and support over all these years my life would have been much, much less enjoyable. She, and our cadre of wonderful family and friends, make our lives full every day. 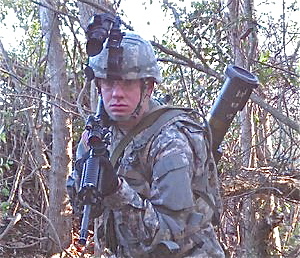 I'm thankful that my grandnephew, Nathan, made it back from his first deployment in Afghanistan this fall without physical injury. I'm thankful for him and all the other young men and women who have volunteered to serve this country and do it proudly even though many back home feel this conflict is not worth the loss of any of our young folks. This has a very familiar ring to it - that was the attitude many people had about MY war - the Vietnam conflict - more than a generation ago. I'm thankful for all the employees of our fine city who have had to endure so much over the past two years. Many have departed, but the more than 450 who remain continue to soldier on, working hard and completing their jobs that keep our city safe, secure and a wonderful place to live. 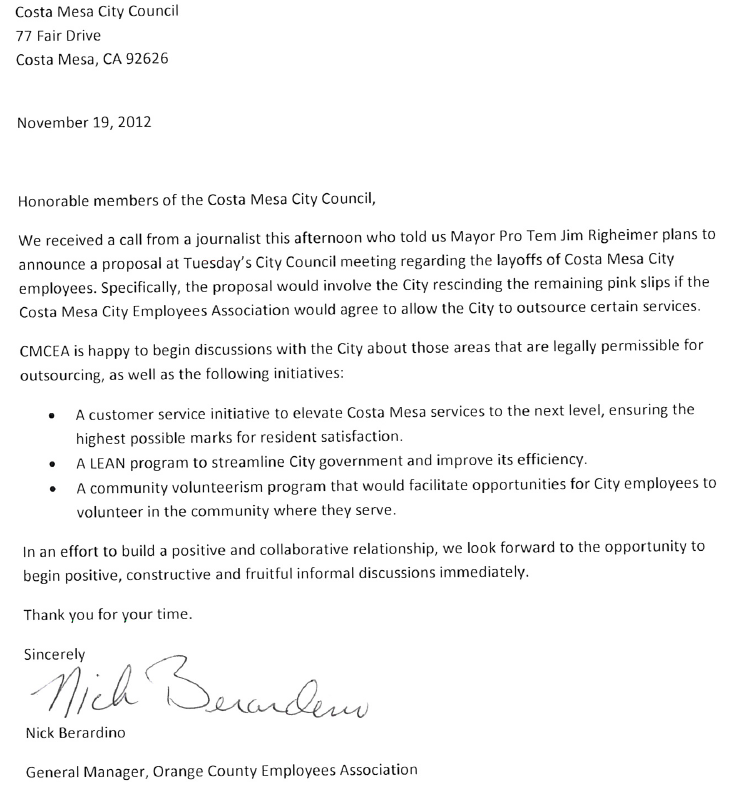 I'm thankful to the folks who formed Costa Mesans For Responsible Government to fight the good fight on our behalf to keep our city from being overrun by the barbarians. 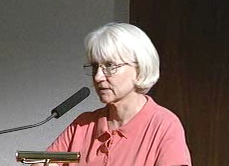 Thanks to Robin Leffler and her merry band of hard-working folks for all they've done for this city. I'm thankful for Wendy Leece for enduring the barbs, epithets and general disrespect and unpleasantness as the lone voice representing ALL the people of the city on the dais for the past two years. Despite being outnumbered she held her ground and did her very best for us. And, finally, I'm thankful for all of you out there who read this blog. Even though many of you don't agree with what you read here, you just keep coming back. I appreciate every one of you for your interest and participation. I don't always like the comments you write, but I try to post most of them to keep the debate spirited. Those of you who attempt to post just plain nastiness have found out that they don't make the cut. To the rest of you, please just keep those comments coming and try to enhance the discussion. Back by popular demand, one of my favorite Thanksgiving video clips to put a smile on your faces. Tuesday night, in their first meeting in over a month, the Costa Mesa City Council got back down to business, but not before an interesting sidebar. 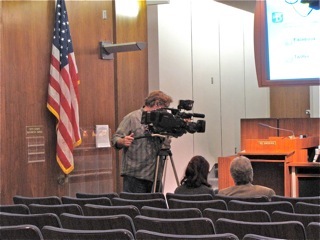 A crew from KCET presented itself in the auditorium at 5:00 hoping to get some footage of the council in action and specifically to interview lame duck Mayor Eric Bever for a story they are doing on homelessness in Orange County. 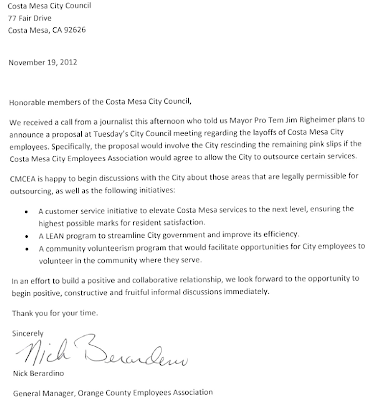 As you may recall, Bever became a lightning rod for criticism recently when he suggested to the City CEO, Tom Hatch, that he investigate ways to shut down the social service agencies that serve, among others, Costa Mesa's homeless population. In typical Bever fashion, he refused to be interviewed and the KCET crew promptly left. OK - a show of hands of those who are glad Bever's termed out? Yeah, that's what I thought - nearly unanimous. Among the presentations made last night was to a group of car owners who have participated in Bever's legacy event - the First Friday Car Show. The owners were presented with what amounted to a "people's choice" award for each show since the beginning in August. 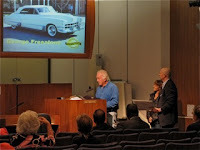 Here you see volunteer Cindy Brenneman and Special Affairs Manager Dan Joyce presenting the award to George Freestone for his magnificent Cadillac convertible. meeting. Most were familiar faces, but the number included Nick Berardino, General Manager for the Orange County Employee Association, who used his three minutes and a little bit more to congratulate Mayor Pro Tem Jim Righeimer for his statement recently that he wanted to rescind all remaining layoff notices and begin negotiating with the employee associations to try to find ways to outsource operations where possible and to improve service to the community. Righeimer watched intently, then confirmed his commitment during his time to speak. Immediately after Berardino spoke Robin Leffler, activist and President of Costa Mesans For Responsible Government, stepped up to address, as she said, "the elephant not on the agenda". She was referring to Righeimer's comment in the press that he "was going to cancel the remaining layoff notices". She reminded the council that, since that item HAD NOT been placed on the agenda, it would be improper for the council to even discuss it at this meeting, much less vote on it. She reminded them that proper procedure required them to have the item placed on a future meeting agenda, which would be "noticed" to the public in time for them to present themselves before the council to discuss it. Her reminder worked because that is precisely how it played out later during "council member comments". The meeting actually moved fairly briskly last night. The Consent Calendar provided some interesting moments when councilwoman Wendy Leece pulled several items for separate discussion. One was one of the five Warrants being considered that included very significant legal bills for Jones and Mayer. She asked stand-in City Attorney Christian Bettenhausen to provide a report to the council on the status of the litigation still pending at a future meeting. Another was the need to continue to retain Tammy LeTourneau of Management Partners for another six months and $37,000. CEO Tom Hatch explained that her presence was still necessary due to the heavy load in Human Resources with the screening of applicants and other items. He said she provided a 16 point plan for managing their Workers Compensation issues that saved lots of money. Hatch announced that Peter Naghavi - who recently announced his retirement - will be sticking around for a few more months to help with the recruitment for his replacement. That's good for the city. The council approved the extension of the current Traffic Impact Fee structure until the consultant hired has finished his review. They also approved the issues involving the second pension tier for the Fire Safety folks - 2%@50 - as the final step in the agreement between the City and CalPERS. The council approved the design of the SR-55 Gateway sign to be placed on Cal Trans property visible to drivers as they emerge from the ditch to the intersection of SR55 (Newport Blvd.) and 19th Street. And, finally, they approved the plans for the formation of a committee to make recommendations for the City's 60th anniversary celebration. Not unexpectedly, several council members added groups to be included to the nearly two dozen recommended by staff. 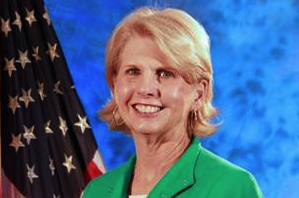 The next meeting will be on December 4th and will mark the changing of the guard as former mayor Sandra Genis replaces Bever on the dais. Since, based on comments made last night by Righeimer on the dais, we seem to be entering a new era of cooperation and conciliation, I have a suggestion for him. How about a demonstration of that new-found attitude by nominating Wendy Leece as Mayor on December 4th? 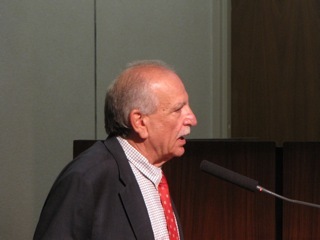 Then Steve Mensinger could nominate Sandy Genis for Mayor Pro Tem. I mean, they've got the votes, so why not show us exactly how magnanimous they are willing to be? I think that would be a great show of class on their part and go a very long way to getting this newer, kinder council headed in the right direction. How about it, Jim? Are you REALLY ready to have the new council function as a team? It's very likely that the count tonight as provided by the Registrar Of Voters is the next-to-last count of this election. County-wide there remain only 100 ballots to be tallied. 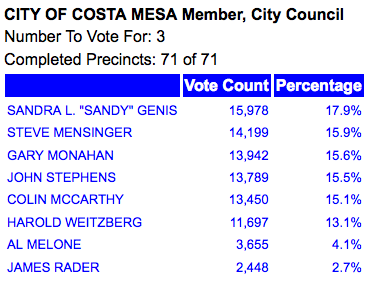 Today Sandra Genis gained another 42 votes, which leaves her at 15,978, and 1,779 votes ahead of Steve Mensinger. The more they count the further she moves ahead of him. 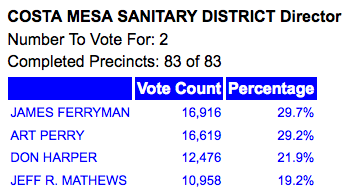 Mensinger had 14,199 votes and is 257 ahead of Gary Monahan. In the all-important race for the third spot Monahan is now 153 votes ahead of John Stephens. Colin McCarthy is 239 votes behind Stephens and Harold Weitzberg lags behind McCarthy by 1,752 votes. Al Melone and James Rader trail the field. Neal Kelly, the Orange County Registrar of Voters, told us his goal was to be finished with the counting by Thanksgiving. It certainly looks like he'll meet that goal with only 100 ballots remaining. What's Righeimer Up To Now? Tomorrow night the Costa Mesa City Council will hold its first council meeting since the election and this one promises to have some highly-charged elements - not that all have not had way, way too much drama for the past two years. RIGHEIMER - "RESCIND LAYOFF NOTICES"
Today Mike Reicher, former ace reporter for the Daily Pilot who now writes for the Orange County Register, broke the story, HERE, that Mayor Pro Tem Jim Righeimer will be "calling for administrators to rescind pink slips issued to employees last year and to negotiate a deal with the labor union." 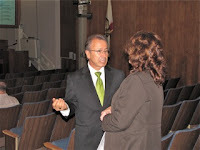 If you've been following Costa Mesa politics for the past couple years, that statement will certainly get your attention - and probably make you curious about what Righeimer is up to now. The Daily Pilot also reported on this story late tonight, HERE. Since he was elected two years ago he and his 4-1 super majority on the dais have run roughshod over the City, violating their own rules on outsourcing, causing a costly lawsuit to be filed which resulted in an appellate court decision that apparently threatens hundreds of other California cities who have privatized operations. 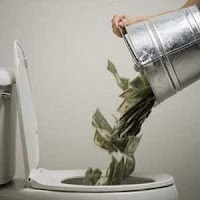 He and his cohorts have stampeded through the municipal governance process using the specter of fiscal disaster and insolvency because of "unsustainable pensions and pay levels". All the while they managed to balance the budget - a direct contradiction of their dire predictions. Righeimer attempted to jam his cut-and-paste charter down the throats of the residents of the city. Fortunately, the electorate is not nearly as gullible as he apparently thought and that charter was soundly rejected by the voters. The last numbers today show 59.8% against it. This was a major defeat for Righeimer and his handlers at the Orange County Republican Party. 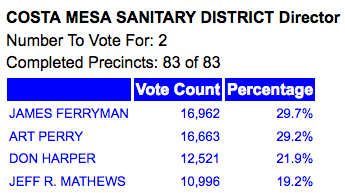 That loss, combined with the rejection of the OC GOP slate for seats on the Costa Mesa Sanitary District, should have rocked them back and made them reconsider their overt attempt to use Costa Mesa as a Petri dish for pension reform and social experimentation. And, we hear grumblings that the GOP power brokers at the Lincoln Club are none to happy with how things went this election. State-wide, my Republican Party suffered the loss of seats in the Assembly that now gives the Democrats a super majority. 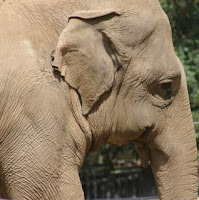 My Republicans are now just eunuchs in Sacramento. I take from Berardino's letter that he, too, is curious about what's up with this overture. Righeimer has demonstrated time after time that he is not beyond playing fast and loose with the rules. Distrust has marked his tenure on the dais. It's going to be very interesting tomorrow night at the council meeting, which begins at 6:00 in council chambers although it will be preceded by a special joint meeting of the city council and Costa Mesa Housing Authority and a closed session. You can read the complete agenda HERE. And, the council meeting was already full of interesting stuff. The Consent Calendar alone holds much to be curious about - like the more than $95,000 billed by Jones Day as the latest bill in their open-ended contract as part of one of the five Warrants the council will consider. I'm also curious about the amendment of the agreement with Management Partners for yet another $37,000 for "interim management assistance". 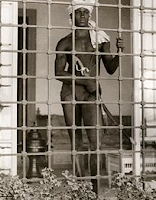 You can read the staff report HERE. The City has added so many people on the 5th floor of City Hall it makes one curious just why we continue to have to have these folks on board, month after month, when we've hired several highly-paid managers. Maybe someone will ask that question tomorrow night. The council will also consider the annual citywide traffic impact fee program and the report from the ad hoc committee. You can read the staff report HERE. The recommendation is to leave the current fee structure in place. 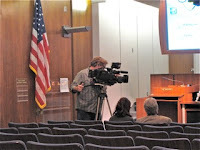 One item of particular interest will be the amendment to the contract with CalPERS and The City codifying the recently negotiated change to the agreement with the Fire Safety employees to implement the 2%@50 retirement formula. You can read the staff report HERE. 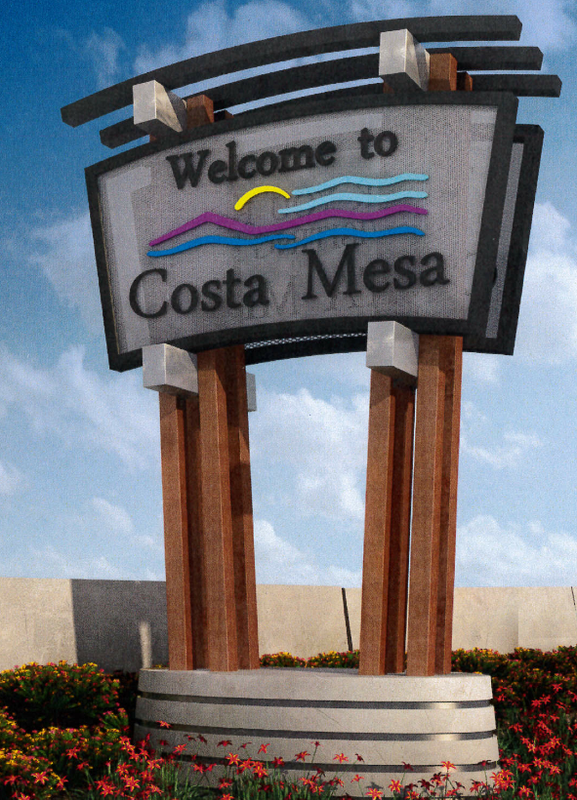 Near the end of the meeting the council will discuss the SR-55 Gateway Improvement Project Monument Sign Design, HERE and the Costa Mesa 60th Anniversary Planning Committee, HERE. The Registrar of Voters updated the numbers today shortly after 5:00. He has promised to have all votes counted by Thanksgiving, so there can't be too many left. The gross county-wide numbers indicate just over 13,000 ballots remaining to be tallied, so we can assume he's going to make his goal. In the all-important Costa Mesa City Council race nothing much has changed. 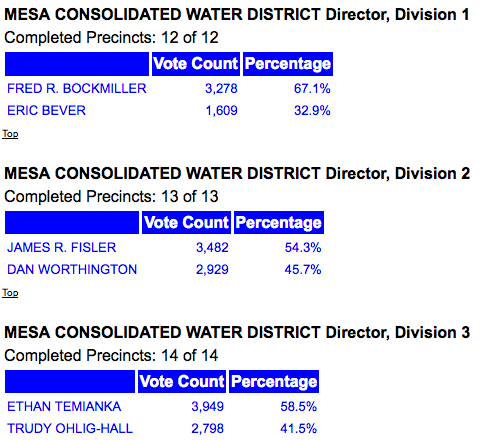 Both top vote-getter Sandra Genis and second place Steve Mensinger picked up another 17 votes. 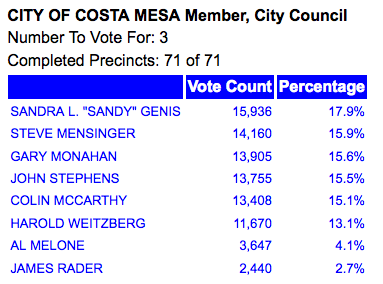 Genis now has 15,936 and leads Mensinger by 1,776. He leads third place Gary Monohan by 256 and Monahan gained another vote on John Stephens and now leads him by 150 votes.